Last weekend myself and Nicola spent a very relaxing weekend at Thornton Hall Hotel & Spa, a four star hotel about 10 miles north of Chester. 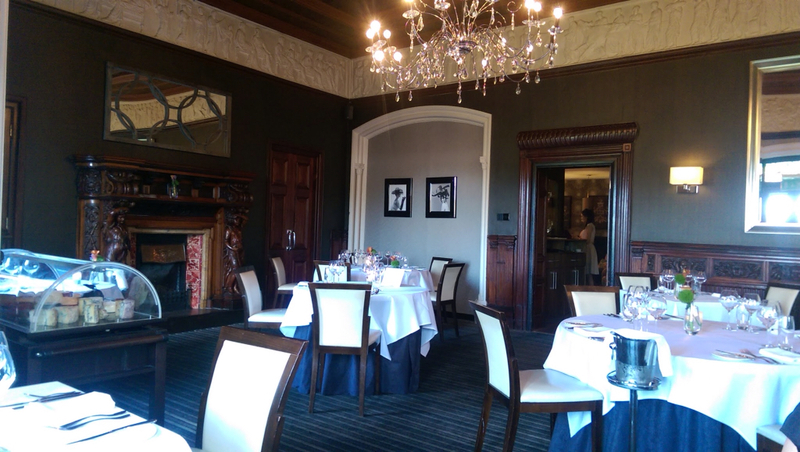 We had been kindly invited to the hotel to try out The Lawns Restaurant which is run by Executive Chef Matt Worswick, who will feature on this year's Great British Menu. Having previously been awarded a Michelin star at Ayrshire's Glenapp Caste, Matt has been appointed with the hope of improving on the three AA Rosettes that Thornton Hall Hotel & Spa currently holds and gain an elusive Michelin Star for their own fine dining restaurant. 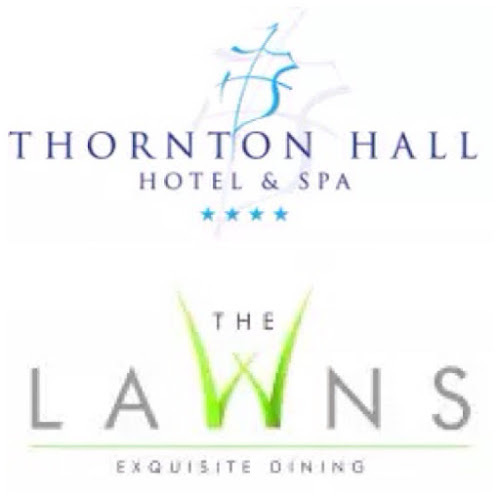 Thornton Hall Hotel & Spa is located just outside the sleepy village of Thornton Hough, Cheshire and has recently undergone a £580k refurbishment. After checking in, we made our way to our room which was very spacious and well decorated with a feature wall with brightly patterned wallpaper that was complimented by the equally eyecatching headboard and soft furnishings. The room was very comfortable and boasted one of the biggest beds that we have seen in a hotel, in fact the bed was so big, we were able to double starfish with ease! When we arrived last Saturday, the weather was lovely with the north of England enjoying a mini heat wave so we were surprised that the room didn't have air-conditioning although a plug-in fan was in the room to help cool things down. (Thankfully, I was able to get a second fan sent to the room later). Another thing that surprised me was the lack of fridge, mini- bar or safe in the room. Now whilst this didn't have any real impact on our stay, I would have expected these features to be standard in a four star hotel. 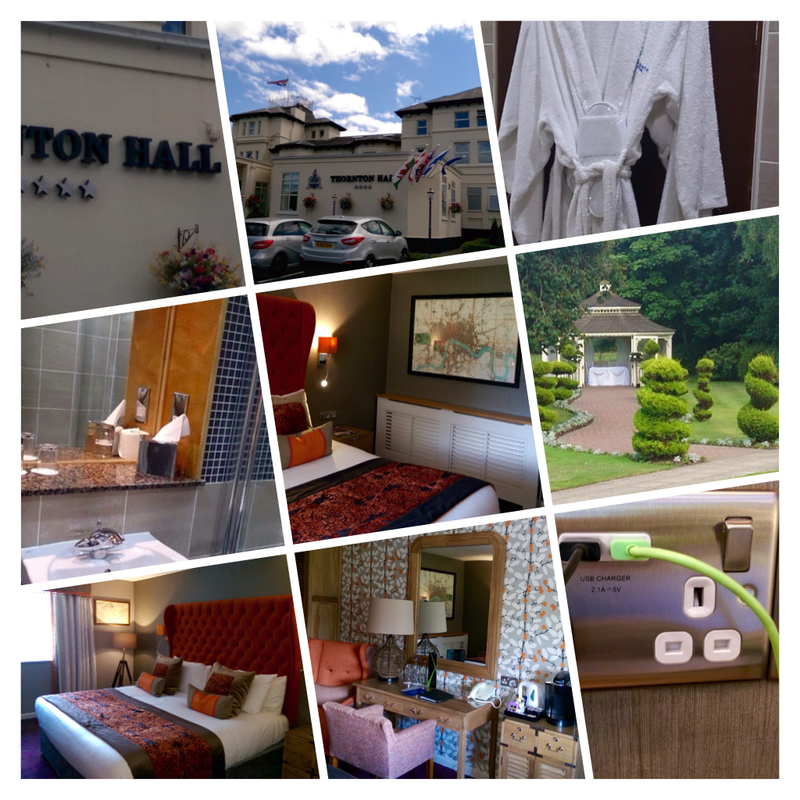 As part of our stay, we had been booked in for a spa treatment at the connecting Thornton Hall Country Health Club. After a long drive, I was able to relax with an Espa Back, Neck & Shoulder massage that was expectly administered by spa therapist Beth. Meanwhile, Nicola was treated to a relaxing Espa Facial from Beth's spa colleague, Shannon. Feeling refreshed, we spent the rest of the afternoon enjoying the swimming pool, sauna, steam room and snow cave (that's right, I said snow cave) before enjoying a drink in the outdoor jacuzzi under the blazing sun. Feeling totally refreshed and relaxed, we made our way back to the room to get ready for dinner at The Lawns. 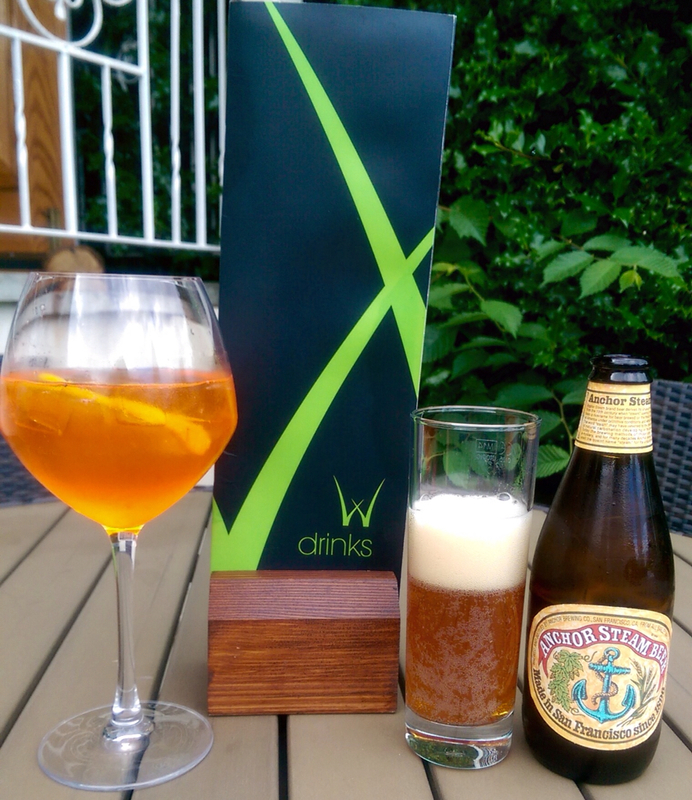 We had time for pre-dinner drinks so made our way to the outside seating area at the bar and ordered from the well priced bar menu. It would be easy for the bar to take the easy route and stick to the usual generic bottled beers so I was pleased to see that they had a decent array of bottled beers and choosing wasn't easy. In the end I opted for a bottle of Anchor Steam Beer from San Fransisco, a great beer with a lovely malty breadiness that set me up nicely for dinner. Never one to turn down the offer of a cocktail, Nicola relaxed in the gardens with one of the restaurant signature cocktails, The Lawn Spritz - a chilling balance of Aperol,Gin, Prosecco and sparkling water. We could have sat outside all night watching the sun go down but before we knew it, it was time for dinner and we made our way through to the restaurant. We were shown to our table which sat in one of the bay windows, giving us a view of the wedding reception that was taking place at the hotel, and settled down and looked forward to our meal ahead. We were ordering from the A La Carte menu which was a three course meal at £55. The menu had a choice of three starters, mains & desserts, and as we tried to decide what to order, we were presented with a little plate of canapés which included a crispbread with taramasalata & coriander, and a cube of slow cooked pork which was deep fried in breadcrumbs. Each of these canapés offered tiny explosions of flavour and gave us a good idea of what to expect for the rest of the evening. 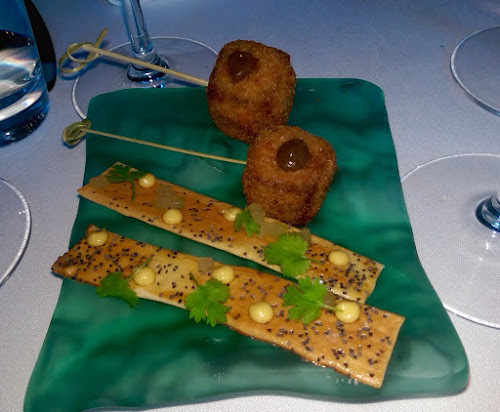 Both canapés were delicious seperately but even better together as the sweet pork and salty cod roe made sure that the tastebuds were awake for the main event. The wine list was fairly extensive with a great selection of well priced wine from across the globe, in the end we settled on a very nice bottle of Wave Rider, a Sauvignon Blanc from New Zealand's Marlborough region. 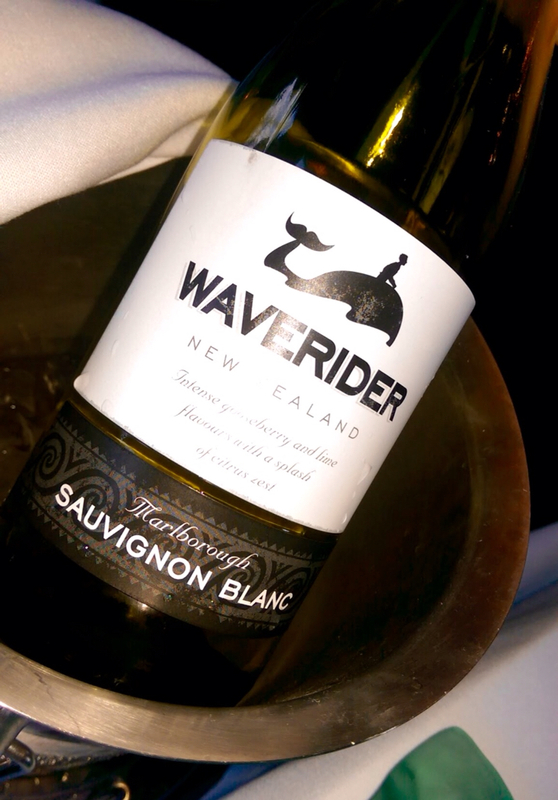 The wine was packed full with tropical notes and worked well with our meal. 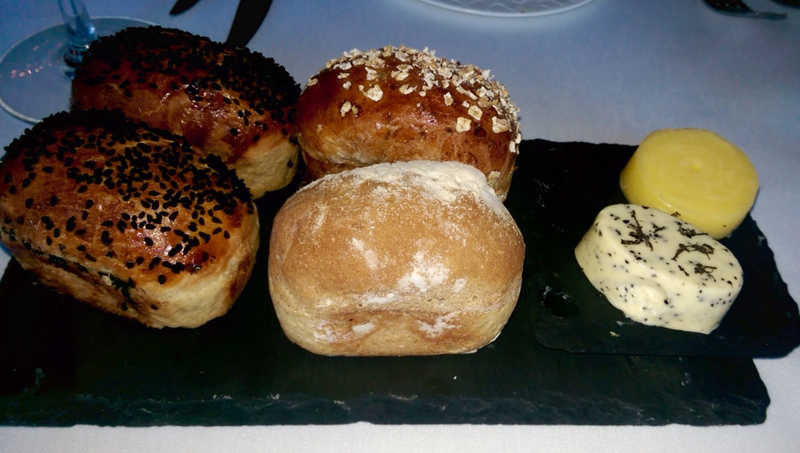 We were next presented with our bread board which consisted of four miniature freshly baked loaves with two butters. The truffle butter was very nice but it paled into insignificance when we tasted the fantastic salted butter which turned out to be from one of the businesses who have previous answered 5 Questions - Abernethy Butter. Before our starter arrived, we were treated to an amuse-bouche of smoked quinoa, cardamom yogurt, Ras el hanout, & sultanas which was an interesting combination of flavours. The dish was a great balance of smokiness, spice, sweet and sharp, once again demonstrating the chefs ability to push our taste boundaries to the edge. It wasn't long before our starters arrived. 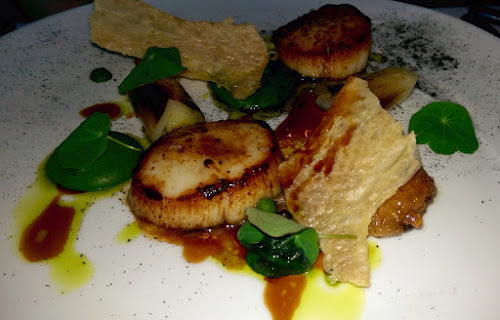 Nicola had ordered seared scallops, sticky chicken wing, & charred leeks, which immediately gave me food envy! The scallops were divine and worked incredibly well with the sticky chicken wings and crispy chicken skin. The sweet pea purée and peppery charred leeks rounded off the plate. 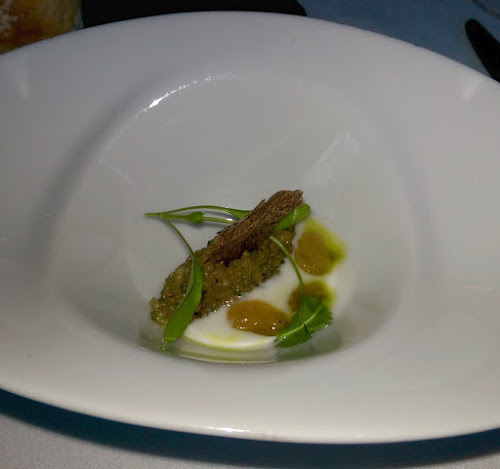 For my own starter I had ordered the foie gras, chamomile, & apricot which was accompanied by little cubes of orange jelly and a granola crumb. 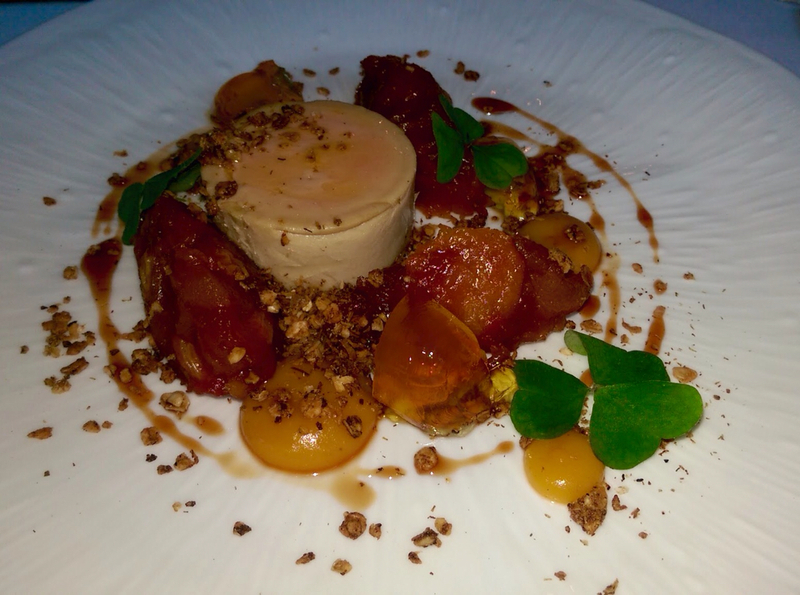 The foie gras was so smooth and creamy that I could have eaten it all night whilst the quenelles of apricot compote were packed with fresh fruit flavour. There was no need for me to have food envy as my own dish was wonderful too - each of the components worked well with each other. 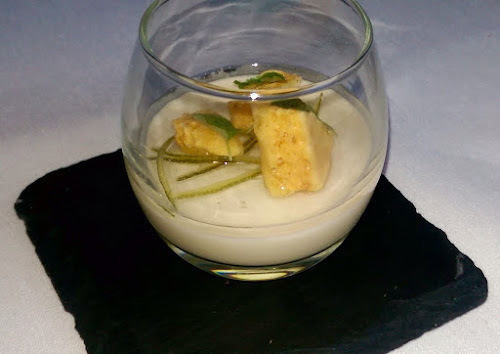 If I were to make one small criticism of the starter, I felt that for my own taste, there were too many big citrusy flavours on the plate to allow the delicate foie gras to really stand out as the star of the show. The main course options included a choice of red mullet, halibut, pork, lamb plus a vegetarian aubergine dish and in a strange break from tradition, Nicola didn't order the lamb! Instead, she opted for the Pork Belly, Confit Potato & Wild Garlic which was amazing! 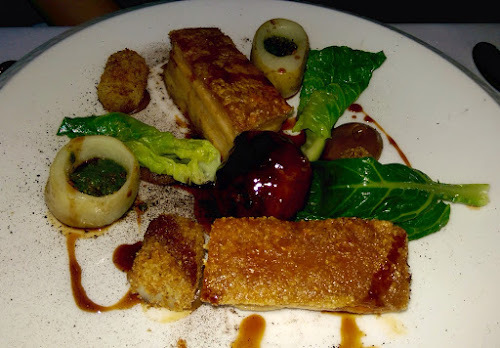 The dish looked stunning and I definitely had food envy here as Nicola cut into the perfectly cooked pork belly. The meat was soft and sweet, topped with the crispest salty crackling and the accompanying wilted greens, wild garlic salsa verde and porky jus brought the dish together nicely. There was a final little surprise on the plate in the form of an intensely flavoured pork bonbon that just melted in the mouth. For my own main, I chose the Loin of Lamb, Asparagus, Peas & Cockles which sounds like a slightly odd combination on the plate but it worked surprisingly well. The lamb was ridiculously tender, and cooked really well. 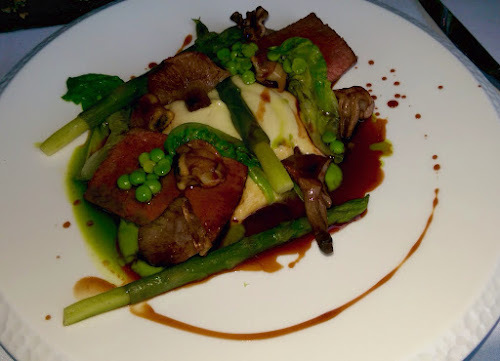 It was served on top of a bed of creamy buttery mash that was well seasoned and although I would have preferred the mash to be a little firmer in texture, it didn't stop me clearing the plate. Fresh asparagus spears with the tails neatly trimmed were joined by fresh peas and wilted baby gem lettuce and a handful of well cooked cockles. Loin of lamb isn't the stron gest tasting piece of the animal but the addition of the cockles and a deliciously rich and meaty gravy helped round of this very accomplished plate of food. By this point of the meal we were both beginning to feel a little full so asked for a short break to allow our mains to settle and let us finish off our wine. Once the last of the wine was gone, we were presented with a pre-dessert and palate cleanser of chamomile pannacotta with lemon jelly, lime shred & honeycomb. It might have looked relatively simple but the balance of subtle and sharp, smooth and crunchy was perfectly balanced. I really enjoyed this little pre-dessert, however this was the only dish on the night that didn't tick the boxes for Nicola. Desserts are always the dish that you expect to see the chef go over the top when it comes to creative design and when the simply named Gariguette Strawberries, Vanilla Parfait & Shortbread arrived, it was clear to see that there was nothing simple here. Fresh strawberries that actually tasted like.... well, strawberries, were accompanied by strawberry coulis, strawberry dust, strawberry sorbet and the creamiest vanilla ice cream wrapped in a cylinder of strawberry ice. 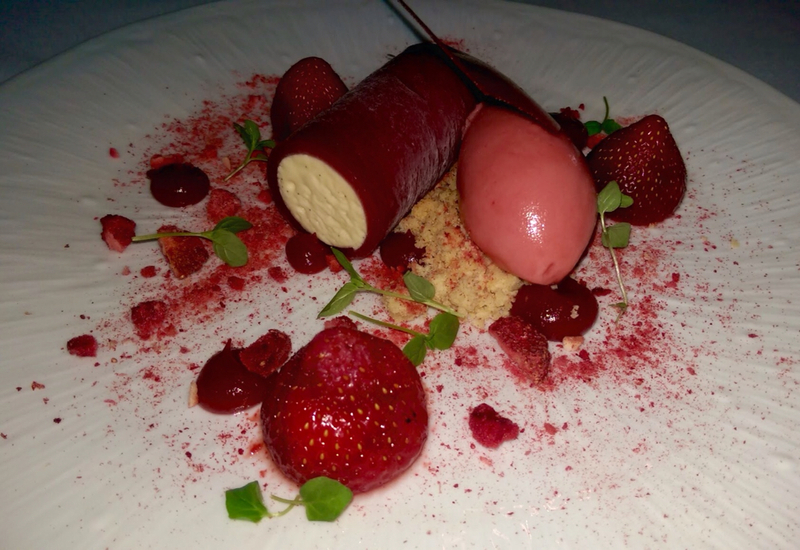 This five ways strawberry pudding was a great way to wrap up a fantastic meal and once again I was slightly jealous of Nicola's choice! I had opted for Dark Chocolate, Aero, Salted Caramel & Yogurt Sorbet which was a much more grown up pudding. Three frozen squares of chocolate that had the texture between ice cream and brownie were layered over frozen meringue crumb, and topped with the saltiest caramel ice cream and sharp lemon yogurt sorbet. 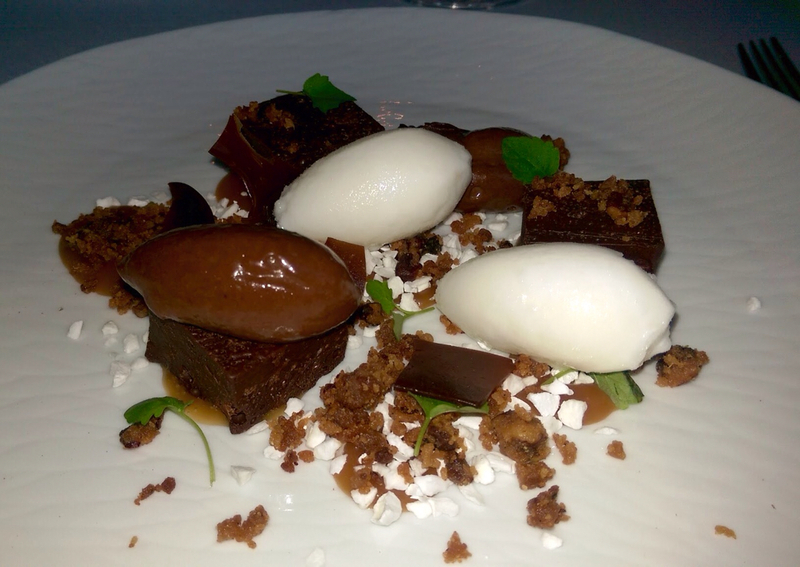 The balance between bitter chocolate, salty yet sweet caramel and the sharpness of the sorbet was sublime. I love a chocolate dessert and this was easily one of the best that I've eaten in a long time. We were both stuffed by this point, plus we were also both feeling the effects of our early start and long drive from Glasgow. Matt had sent me a tweet at the end of service to let me know that he was planning on coming out to say hello so we made our way through to the bar for a nightcap whilst we waited on chef to finish up in the kitchen. When Matt arrived a few minutes later, he was bearing gifts of a tray of petit fours which included homemade fruit jellies, homemade fudge and an amazing salted caramel chocolate pot! What a way to finish of a great night. Matt has a real passion for quality food and he explained to us that he wanted people to think of The Lawns Restaurant as a "go to" destination for fine dining. The a la carte menu is £55 for three course but in reality, when you include the canapés, amuse-bouche, pre-dessert and petit fours, diners are actually getting fantastic value for money on what is essentially a seven course meal. Myself and Nicola have been lucky enough to have had a couple of Michelin chefs cook for us and I can honestly say that some of the cooking that we had on the night was every bit as good as those Michelin meals. There is currently only one restaurant on Merseyside that boasts a Michelin star but I wouldn't be surprised to see The Lawns added to that number when the new list is published in October. Executive Chef Matt Worswick is already a well known name in and around Merseyside but by the end of the Summer, he will be much more widely recognised as he is due to appear on this year's Great British Menu representing the North West in the popular TV show. If Matt turns out the same quality of food that we had when we visited The Lawns, I'm sure that the restaurant will definitely see an upturn in new diners. I wish that we had more time to spend at the hotel but as I have a shortage of annual holiday days left, we could only stay the one night and before we knew it, it was Sunday morning and time to check out. Although I can safely say that this will not be the last time that we are guests at the hotel. Both myself and Nicola would like to thank the hotel for their generosity and also thank all those involved at the hotel and spa for making sure that our stay was enjoyable and relaxing. Special thanks to Assistant Restaurant Manager Jen Eastwood and her waiting staff who looked after us in the restaurant. Last but definitely not least, a massive thanks to Matt who served up a fantastic dining experience and also took time out of the busy kitchen to chat with us after service. Keep an eye out for Matt on BBC2 when The Great British Menu returns to our screen and also keep an eye out for Matt's answers in his very own 5 Questions post coming soon. I would like to say that although we were guests of the hotel and restaurant, all views above are my own honest opinion of our stay. Myself and Nicola would have no hesitation in paying for a trip to Thornton Hall Hotel & Spa or The Lawns Restaurant in the future.